Archaeologists unearthed a stone tool at an ancient rock shelter in Oregon that could be older than any known site of human occupation in western North America. 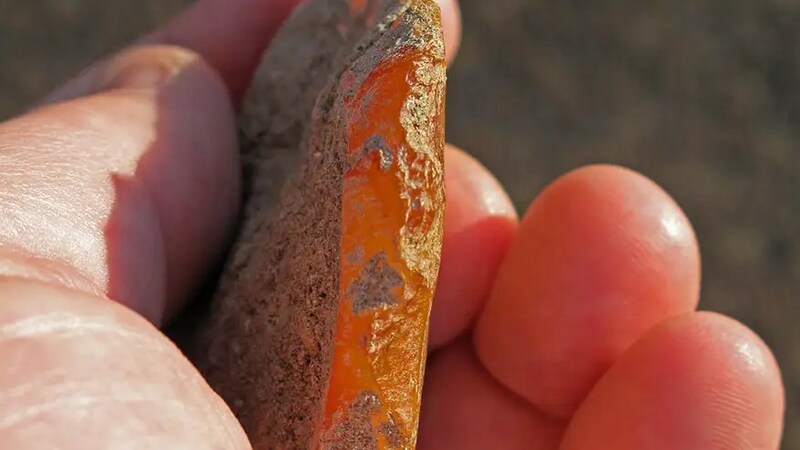 The hand-held scraper was chipped from a piece of orange agate that is not normally found in eastern Oregon. The tool was found about eight niches below a layer of volcanic ash from an eruption of Mount St. Helen’s dated from about 15,000 years ago. The depth was about 12 feet below the surface. The U.S. Bureau of Land Management announced the find Thursday. An archaeologist from the agency, Scott Thomas, said that if the age of the site holds up to scrutiny, it would be the oldest west of the Rockies, predating the Clovis culture that is believed to be the first people to migrate from Asia to North America about 13,000 years ago. University of Oregon archaeologist Patrick O’Grady supervises the dig at the Rimrock Draw Rockshelter. He called the find “tantalizing,” but hopes to find out if the volcanic ash covers the entire area. Donald K. Grayson, professor of archaeology at the University of Washington, said the scientific community would be skeptical. Two pre-Clovis sites are generally accepted by scientists, Grayson said. One is Paisley Cave, 60 miles southwest of the Rimrock site and another is in Mount Verde, Chile. Both are dated about 1,000 years before the oldest Clovis sites. The find has yet to be submitted to a scientific journal for publication, but it has been reported in newsletters and at conferences, Thomas said. Thomas found the site several years ago, while taking a break from carrying supplies to a session of the University of Oregon Archaeological Field School nearby that O’Grady was overseeing. Thomas said he noticed an outcropping of an ancient lava flow, with some very tall sage brush growing in front of it, indicating very deep sediment deposits. The soil was black in front of the rock, indicating someone regularly built cooking fires there for a long time. An ancient streambed ran by, which would have given people more reason to stay there. And on the surface, he found a stone point of the stemmed type, found at sites both older and younger than Clovis. Similar points have been found at Paisley Cave.